The Royal Wedding | "Northern Crossings"
I wasn’t all a Twitter about the royal wedding like many were. I confess to watching some of it but basically doing other things. I was mildly interested in what the preacher would say being a bishop from the United States but I must confess I did not hear his message but I was interested in the reaction. What is fascinating is the vast majority of people from Britain enjoyed his message very much. But if you want to know what is wrong with Christianity in America today the remainder of the opinions is fascinating. The one tweet that stands out to me the most is very simple. In talking about the sermon the tweeter says, “strange for a wedding! Longer than the vows”. Christ these two sinners wash their sin in his blood, and can double their joy is somehow some kind of a strange message that no one’s ever preached before. what some have called categorical preaching which basically means that if we don’t preach Christ and him crucified everything else is hell and damnation. What we hear are the following. The optimist club sermon – be happy think happy live happy. There is the I’m OK you’re OK sermon. There’s the Barney the dinosaur sermon – I love you, you love me where a big dysfunctional family. and variations on those themes. The preaching of sin and grace is getting harder to find. The absolute claims that have to be made if we believe that Jesus is Lord are lacking. 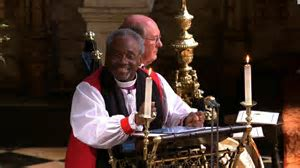 So Bishop Curry, thank you. You preached for 13 minutes which some thought was too long but you also mentioned Jesus. Jesus was mentioned at a Christian wedding – that is a step forward. They are not alive to hear it! A Testimonial for the Mercy Conference in Minot.